The great virtue of this Vermentino is that it enhances the aromas and flavours peculiar to Bolgheri. Its clean, crisp flavour and purity are its distinguishing features. The grapes are harvested when their colour changes to an intense yellow. 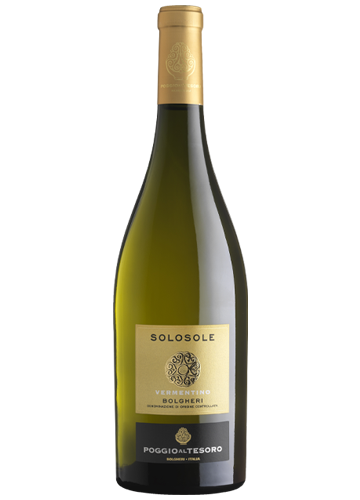 The name Solosole, meaning 'just sunshine', derives from the fact that the wine is essentialy a direct result of the work undertaken in the vineyards and the ripening sun. 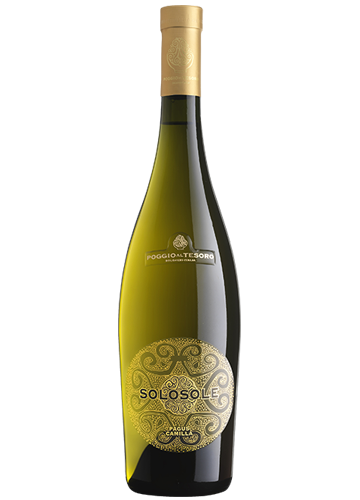 Tasting notes Golden yellow in colour with greenish hues, Solosole opens with notes of stone fruits such as peach and apricot, followed by sulphurous and flint-like notes. It has a medium body, with generous fruit character. The finish is long, dry and zesty, especially when young. It evolves interestingly in the glass, an indication of its excellent ageing capacity. Food pairings Appetizers, raw fish and, thanks to its freshness and aromatic character, fried seafood, fish stews and vegetable dishes. Serve at 8-10°C and open just before serving. 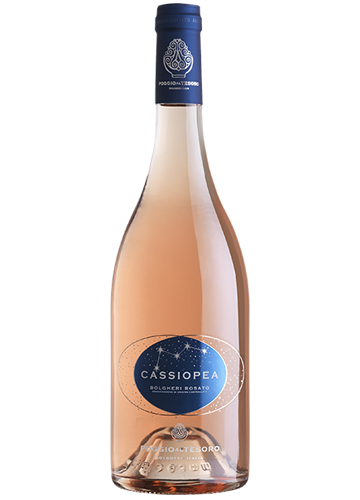 Cassiopea is a rosè with character, expressing both complexity and simple enjoyment. Its distinctive aroma blends well with its crisp flavour and easy-drinking style. Tasting notes Pale pink in colour, on the nose it proffers hints of flowers and small berries such as blackberry and raspberry. The palate is fresh with satisfying savouriness and succulence, and a long, lingering finish. Food pairings Ideal as an aperitif, with bruschetta, fried fish or vegetable tempura, it also pairs perfectly with soups, grilled white meat, and fish dishes. Enthusiasts also advise pairing it with creamy cheeses such as robiola, salted ricotta and mozzarella. Serve at 8-10 °C and open just before serving. 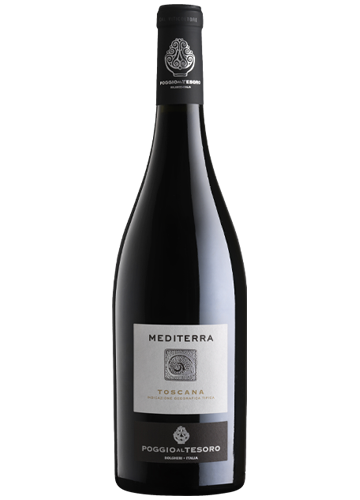 The flavour of Mediterra fully reflects the characteristics of Bolgheri, displaying an extraordinary harmony between the freshness of its aromas and its warm, powerful flavours. The spicy note lent by the Syrah varietal makes the wine intensely enjoyable as well as easy to drink. Tasting notes Ruby red in colour with purple tints, this is a fragrant and intensely fruity wine, in which blackberry, plum and cherry are underpinned by spicy notes of white pepper and elegant herbaceous aromas. On the palate, it is fresh, intense, and surprisingly persistent. Food pairings Meat dishes, cured meats and medium-mature cheeses such as pecorino, caciotta and toma. It should be served slightly chilled with fish dishes such as mullet with tomatoes, fish stews and Livorno-style baccalà (traditional salt cod). Serve at 14-16°C and open just before serving. The Seggio river is the largest watercourse in the municipality of Castagneto Carducci. 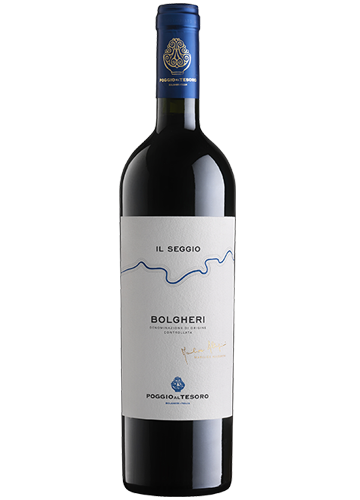 This Bolgheri Rosso is produced with typical grape varieties, carefully harvested and vinified to ensure density and concentration but also to create a very fresh and easy-drinking style of wine. Tasting notes Intense ruby red in colour. The nose exhibits lovely fresh, crunchy fruit, enriched with mineral and spicy notes. The palate is medium bodied with hints of red berries. The elegant, silky tannins are wholly enveloping and velvety-soft. The finish is pristine, clean, and vivacious. Food pairings It pairs effortlessly with a wide range of dishes such as grilled meats – especially Chianina beef – spit-roasts, ossobuco, charcuterie of wild boar, medium-matured and fully-matured pecorino cheese, and smoked ricotta. It is enhanced with pasta prepared with white meat ragout, pappardelle with hare. Serve at 16-18°C and uncork an hour before drinking. Tasting notes Intense ruby red in colour, the nose opens with nuances of cherry and plum and deep notes of black berries, followed by aromatic herbs and a pleasant spiciness. 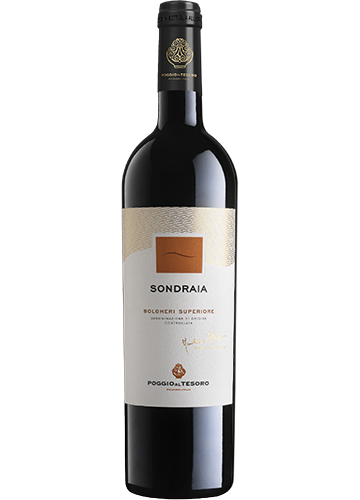 It is elegant and seductive on the palate, revealing considerable body, great structure and balance, and silky tannins. Food pairings Grilled and barbequed meats – Chianina beef in particular – roasted veal, spare ribs, ossobuco, and lamb or pork shanks. Excellent with smoked ricotta cheese, Parmigiano Reggiano and medium-matured pecorino. Serve at 16-18°C and open one hour before drinking. Bolgheri's terroir, with its proximity to the sea and the particularly favourable exposure to the sun, allows Cabernet Franc to thrive. In this microclimate, Cabernet Franc vinified as a single varietal enhances its spicy nuances and gains elegance and depth. 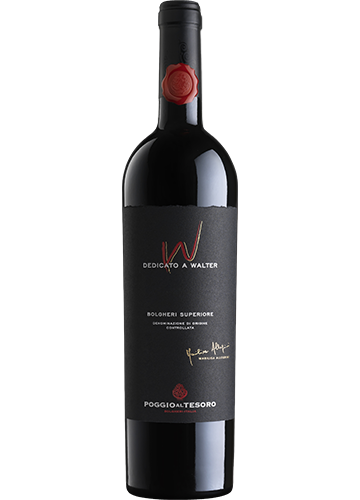 The wine is named after Walter Allegrini and symbolizes the love he felt for this land. Tasting notes The deep colour immediately testifies to the richness of this wine, which is then confirmed by aromas of black berries, pepper and eucalyptus that harmoniously merge together and create great depth. It is striking for how it manages to support an impressive structure with lightness and tension, making it powerful yet at the same time agile on the palate. Food pairings Particularly suited to rich and succulent meat dishes, such as lamb, pigeon, duck, and hare, as well as to stews and meat braised in red wine. Perfect with a fine selection of mature cheese. Serve at 16-18 °C and open at least one hour before drinking. The Ancient Romans used the word ‘Pagus’ to identify a rural area that was of special agricultural value. This is still true today of Pagus Camilla, part of the vineyard called Le Sondraie, which lies near a natural oasis of the same name. Here, alluvial sediments with elevated mineral content yield a ‘rare’ 100% Vermentino. Tasting notes The wine proffers intense Mediterranean aromas, expressing a textured combination of aromatic herbs and citrus notes. The palate exhibits pristine, pure Vermentino, characterized by a satisfying savouriness, minerality and a structure that promises great longevity. Food pairings Pagus Camilla is the ideal accompaniment to both sea and lake fish, and is excellent with prestigious raw fish dishes, Livorno-style mullet, Lake Garda sardines and various refined tempura specialities. It pairs perfectly at the end of a meal with Doppia Panna soft cheeses and Tuscan Pecorino. Serve at 8-10°C and uncork just before drinking. Production of rosé wines in Bolgheri goes back to ancient times. 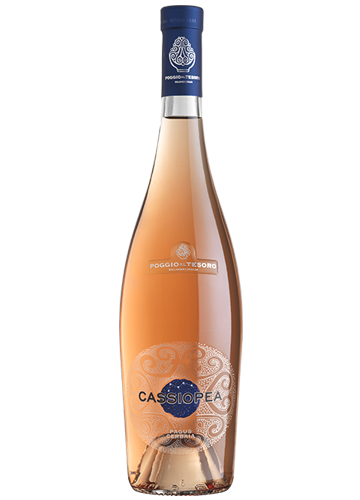 Starting with Cassiopea, rosé production at Poggio al Tesoro is now extended with Pagus Cerbaia, a small but precious parcel of land with sedimentary soils. Here, our special selection of red grapes, such as Syrah and Cabernet Sauvignon, are partly fermented in amphorae and partly in oak casks. Tasting notes Pink nuances reminiscent of spring blossom and fresh scents of flowers interlaced with sweet-sour woodland berries. The succulent palate is impactful and soothing. Food pairings In the case of meat, it enhances the flavour of white meats like chicken with peppers or stewed rabbit with tomatoes and onions. In the case of fish, it pairs perfectly with whole sea bass baked in salt with Mediterranean side vegetables, and baked John Dory served on a bed of black olives. Serve at 8-10°C and uncork just before drinking. 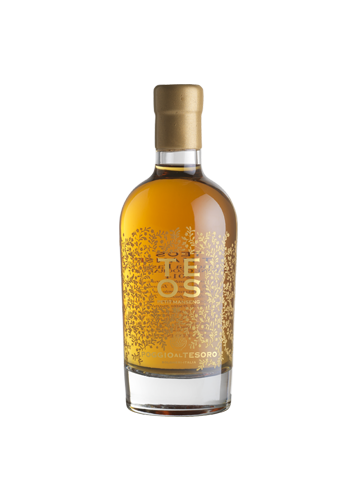 Teos, the ancient Greek city dedicated to Dionysus, is the name of this sweet wine by Poggio al Tesoro. Allegrini’s expertise in the appassimento technique has inspired the creation of this Petit Manseng made with partially dried grapes. Tasting notes The palate is never excessively sweet and is refreshed by a vein of acidity and aromatic nuances of caramel and liquorice.  The wine thus retains harmony and lightness, leading to a dry finale that eagerly invites a further sip. Food pairings Teos requires pairings that are refined enough to exalt its characteristics, such as white chocolate delight and exotic fruit or chamomile ice cream with mango sauce. Daringly successful pairings can be made with a range of fresh, herbed alpine cheeses. Serve at 10-12°C and uncork just before drinking. Tasting notes Intense green colour, with golden highlights. It has a fruity aroma, with distinct hints of artichoke and almond and a slight herbaceous scent. It has a decisive but balanced profile and is ideal for everyday use in the kitchen. Its unique personality is apparent even when drizzled on simple 'bruschetta' made with Tuscan bread, or what is referred to in local dialect as 'crogiantina'. Production method The olives are harvested exclusively by hand starting at the end of October. 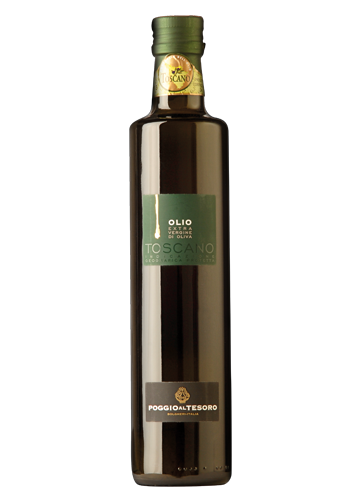 They then undergo a cold pressing within 24 hours to ensure that the fragrance and authenticity of the olives remains intact, whilst maintaining the nutritional properties. Tasting notes A condiment with a pleasant sweet and sour flavour, ideal in salad dressings, vinaigrettes and marinades for fish and drizzled on top of fried foods and meat. 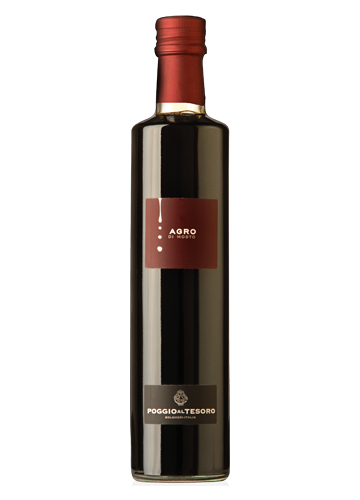 Food pairings Agro di mosto is produced via the slow fermentation and successive acetification of the cooked grape must in oak casks. It is bottled very young in order to preserve its fruity flavours and fresh acidity.